A group of experts begins landing on Nishinoshima island to conduct scientific research for the first time after volcanic activity expanded the total land area. The surface of the island is mostly covered by lava and rocks. Researchers went ashore for the first time on a dramatically reshaped volcanic island far south of Tokyo to study the rare geological phenomenon and assess how life will take root again on the rocky lava. 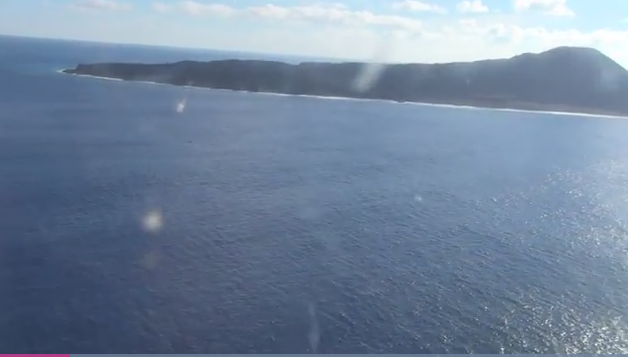 An Asahi Shimbun reporter who followed the landing from the air was struck by the contrast of the blue sea and the island's covering of dark and reddish brown lava. No smoke was rising from the volcanic cone. Sparse vegetation exists on a tableland between the volcano and the beach, and white seabirds were riding the wind currents. Nishinoshima island in the Ogasawara island chain, about 1,000 kilometers south of Tokyo, had been expanding in size since November 2013 due to a series of eruptions. A new spout of a submerged volcano arose next to the original island, and the original Nishinoshima has merged with the new island. No eruption and lava flow have been observed since last November. The Japan Meteorological Agency downsized its warning advisory for the volcano from a 1.5-kilometer radius to 500 meters in mid-August, prompting the researchers to plan the visit to the periphery of the island. A group of experts from different fields, including a team from the University of Tokyo's Earthquake Research Institute, approached the island in rubber dinghies from a research ship anchored a few hundred meters from the shore. The members swam the last stretch of water and made landfall just after 8 a.m. The researchers aim to ascertain the processes involved in the growth of a volcanic island, and how flora and fauna start to colonize on one mostly covered by lava. The group departed from the port of Yokosuka in Kanagawa Prefecture on Oct. 16 in the 66-meter-long, 1,629-ton research vessel owned by the Japan Agency for Marine-Earth Science and Technology (JAMSTEC). Over the two-day trip, the researchers will gather rocks spewed out of the volcano and set up monitoring systems, including a seismometer and an infrasonic meter. A team of biological experts will also examine and record existing flora and fauna on the island as part of studies on how a new ecosystem will develop on the island where the old one was almost completely lost. As of September this year, the island measured 2.7 square kilometers, about 12 times its size before the eruption began.